Southern Chateau: My Fancy New Curtains! Everybody who knows me knows that I am a fabric addict. I love many different kinds of fabrics; cotton prints, linens, silks. I love them all. In fact one of my famous lines is "So many fabrics, So little time"! Sometimes when I receive the notice that a fabric I have in my line will be discontinued and I haven't had a chance to design something with it, I will buy some yardage and hold it until the right room or project comes along. This was the case recently when I had on hand a gorgeous silk damask that I had admired and bought after being discontinued. 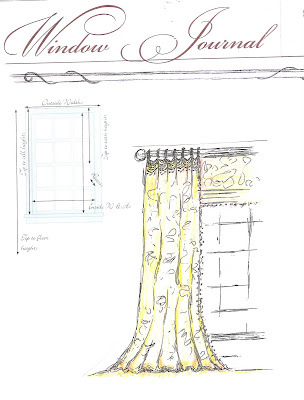 I wanted a change from the green striped silk that had hung there for several years, so I finally sketched up a design. I wanted a dressy look since this window is on the front of the house and is in my office. I added a ruched-cuff heading and lots of fullness in width. I also splurged on heavy English bump interlining which gives body and richness to silk like no other interlining. I think they will be a nice dressy look for the holidays. Thanks for looking! Absolutely gorgeous!!)!!!!!!! I love the trim and the ruching! Just beautiful!!! Which tell us that how should we have to manage our interior decoration of our house..
Gorgeous design. I love the heading! this is a pretty heading. I would love to see what it looks like with the drapery pulled shut. Or more details on how it was put together. I own my own workroom and it is always fun to see a new heading. this is a lovely drapery. I would love to see the heading with the drapery pulled shut. I own my own workroom and it is always nice to see a new heading. Thank you, Kathy. Unfortunately, I have taken these down and am in the process of doing a new design in this room. Otherwise, I would love to show them closed. Glad you like my design!